HOUSTON (AP) — Everyone agrees that Deshaun Watson took far too many hits last week against the Dallas Cowboys. That doesn’t mean Houston’s quarterback is going to change the way he plays on Sunday when the Texans (2-3) host the Buffalo Bills (2-3). Many of those hits against Dallas came on runs when he simply refused to slide, something that he won’t apologize for. 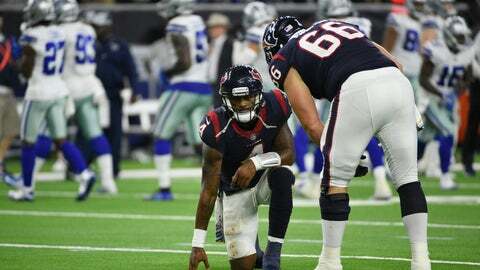 Coach Bill O’Brien doesn’t blame his young quarterback for trying to make plays, but is looking for ways to limit how many blows he takes. Many running quarterbacks have had their production — and careers — curtailed by getting hit too hard too often. The repeated hits from the Cowboys left Watson a bit banged-up this week, but he insisted that he’s fine and won’t be limited against Buffalo. He was asked if this was the sorest he’s ever been after a game. Buffalo coach Sean McDermott said he spent some time with Watson before he was drafted last year and raved about him as a person and a player. He knows a key for his team Sunday will be finding a way to limit his dynamic plays. As the Bills try to bring rookie quarterback Josh Allen along, McDermott knows that improving his team’s running game will help the process. “To me, they go hand in hand when you’re trying to be responsible with a young player, a young quarterback in particular, that some form of balance is important,” he said. The Bills have struggled on offense so far and their 221.2 yards a game rank 31st. They’re averaging 121.8 yards passing a game, the lowest output in the league. Despite those numbers, McDermott is careful not to put too much pressure on Allen to turn things around by himself. Houston defensive end J.J. Watt looks to have put the last two injury-filled seasons behind him and is tied for first in the NFL with six sacks this year. Watt is tied with Cincinnati’s Geno Atkins and his young brother, Pittsburgh’s T.J. Watt. The Texans have been impressed with the development of rookie WR Keke Coutee, who has played the last two games after sitting out the first three weeks with a hamstring injury. The fourth-round pick has 17 receptions for 160 yards and scored his first touchdown in Sunday’s overtime win against the Dallas Cowboys.